There have been many articles circulating the internet talking about how running and cardio in general will cause you to gain fat and lose muscle. I want to go over my own case study to show why this is silly. 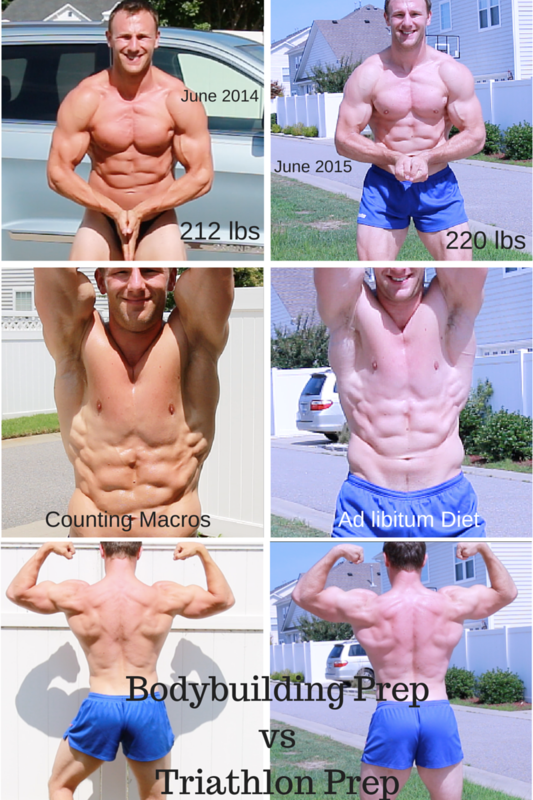 One year ago, I trained and dieted for a bodybuilding competition. This year I wanted to do a triathlon with the goal of keeping my muscle (and gaining if possible) and increasing my endurance/cardiorespiratory fitness significantly. With this in mind. I hired the best coach out there who specializes in helping those achieve that exact goal – Alex Viada of Complete Human Performance. Since a picture is worth a thousand words (or whatever), let me show you the results. Conclusion: Triathlon training takes away your pigment. Okay but seriously take a look at this. I did not lose any muscle, I gained a small amount if anything. My VO2 max increased significantly. I started off with a mile run of 6:45 and dropped it down to under 6 minutes (5:50). I am able to run more than 5 miles at a time plus bike at 20 mph for at least an hour. I couldn’t do any of this before because I was busy being a meat head who only liked to lift weights despite prescribing both resistance and aerobic training to my patients (doing a combo is best for all-around health). Heck, the ACSM guidelines even say it right there that there should be a combination of aerobic and resistance training. I had a SIGNIFICANT increase in my cardiorespiratory fitness, which is something I preach to my patients since it is a major predictor of health / death and maybe even MORE important that body composition (excess fat). Not only that, but I was able to maintain a lean body while increasing muscle mass AND eating much more food (and dessert – more on that in a second). Monday: 3 mile run. Sometimes a fast tempo or progression. Tuesday: Upper body strength. A lot of bench press and bent over rows etc. About an hour long. Wednesday: Lower body strength. A lot of trap bar dead lifts, split squats, trap bar walks, etc. Hour long. Thursday: Off at first, but after a few months turned into a 40 minute slow bike ride or run. Friday: Upper body volume day and a swim. Total of 2 hours. Tried not to drown. Saturday: Long run. 5 miles or so. Sunday: Lower body volume day and bike. Killed the legs. Total of 2 hours. As stated in the comparison picture at the beginning, it was ad libitum (whatever I wanted without counting any calories/macros). With that being said, I ate generally 4-5 meals per day. A rough estimate of my breakdown: 30-50 grams of protein, 50-150 grams of carbohydrates (depending on activity), and about 20-30 grams of fat all per meal. Total of 150-200 grams of protein, 300-500 grams of carbohydrates, 100-150 grams of fat per day. Around 3000-4000 calories (likely more though on double training days). This is a super rough estimate as I pretty much ate according to my activity levels but always had a decent dose of protein per meal. I usually save dessert for a day or two per week but with this training I decided to have it 4-5 times a week. I don’t recommend this as I will explain in a bit, but I wanted to test my limits. My usual dessert was Trader Joe’s salted caramel gelato with freshly baked chocolate chip cookies or cupcakes. An easy extra 500-900 calories. 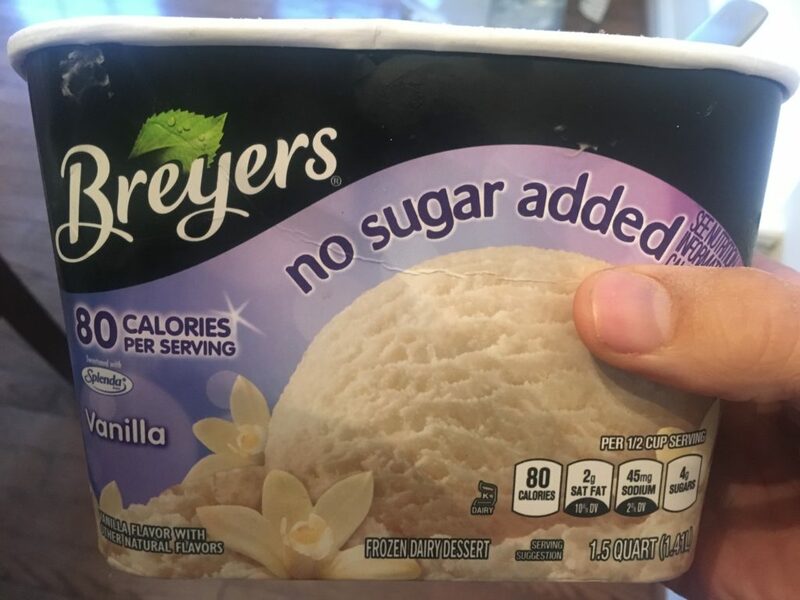 Sometimes I saved calories by using Breyer’s no sugar added ice cream too. As shown clearly in the pictures, I outran my fork in terms of body composition. What about my labs? 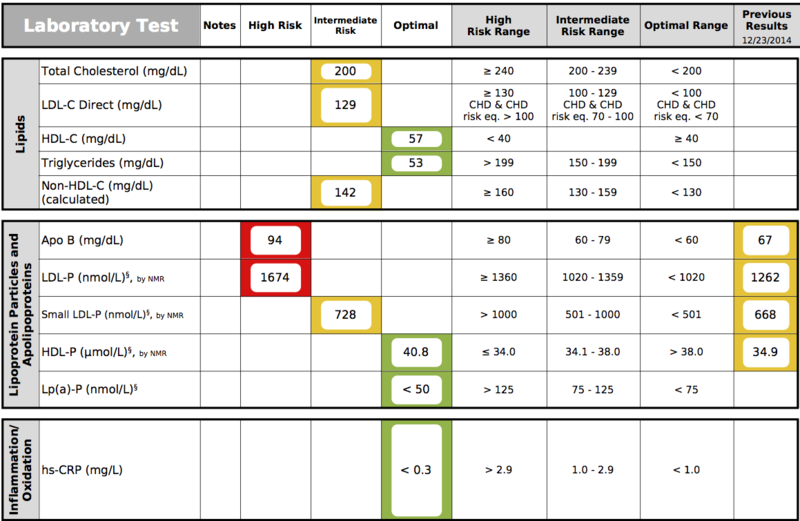 My labs looked terrific EXCEPT for my increase in LDL-Particles. I went from my lower average of 1200 nmol/L to around 1600 nmol/L. Read more about why particles matter more than the cholesterol (here and here). My advanced markers of insulin sensitivity were phenomenal and my testosterone barely budged (about 500 ng/dL which is my average). So am I REALLY able to outrun my fork and is eating highly refined dessert every night optimal? I would hedge on no. I don’t recommend anyone eat high amounts of this highly palatable delicious food frequently. I recommend having it every once in a while as a treat though. It is possible that I was just in a slight overall caloric surplus, which increased my particle count. Hard to say and because this wasn’t a randomized controlled trial we will never know. 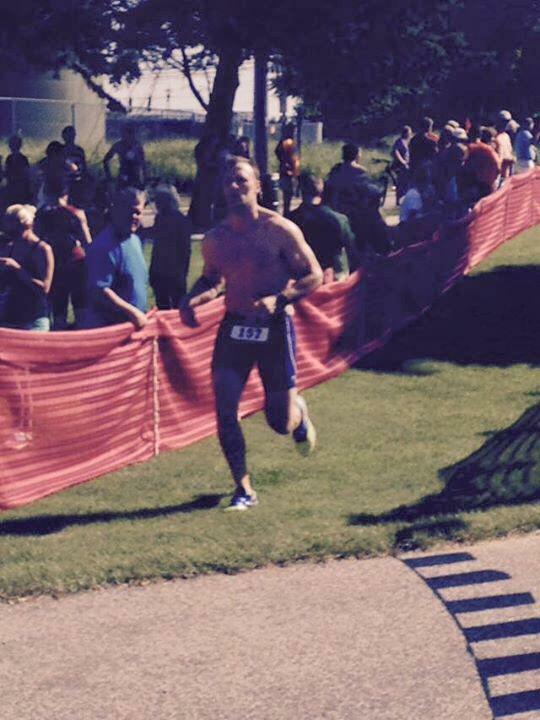 Despite wanting to die in the super cold Lake Michigan water and being the last one of my group out of the lake, I took second in the Clydesdale under 40 division. I made up a lot of time on the biking and running. I was able to pass many people on the big hills because of my leg strength and continue on the run (under an 8 minute per mile pace, 6:30 at the last half mile or so). Will I do it again? Maybe. I just need to actually learn how to swim in freezing water apparently (I did have a wet suit). 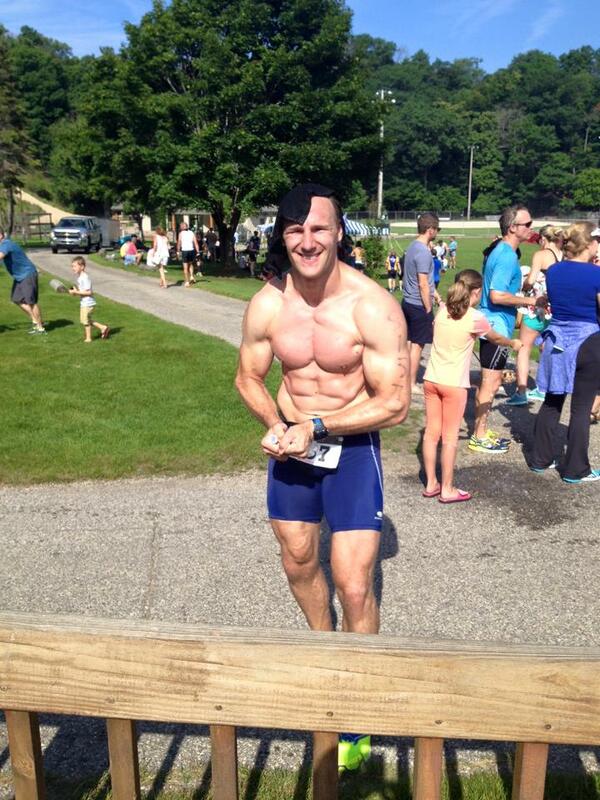 Flexing after some rest at the finish line. A combination of resistance and aerobic exercise is what I recommend (and follows the most up to date evidence for health). Doing so strategically will not hinder your muscle/strength gains excessively. Is it the MOST optimal way to gain muscle? Probably not, but you should care about health mostly unless you’re a competitive bodybuilder/powerlifter who doesn’t care about health (lol). It isn’t easy to start out with the amount of exercise I was (still am) doing. If you’re a patient of mine or just trying to get into exercising more, I recommend taking a look at my basic exercise plan for fat loss. If you are already an avid weight lifter and/or endurance exerciser, and you want to learn more about how to incorporate this training into your routine, I HIGHLY recommend getting Alex’s book – The Hybrid Athlete. Or if it is TL;DR then just hire Alex or one of his minions at www.CompleteHumanPerformance.com. Join my Fat Loss Prescription Program where you learn how to lose fat and keep it off without counting calories or following a no carb diet. 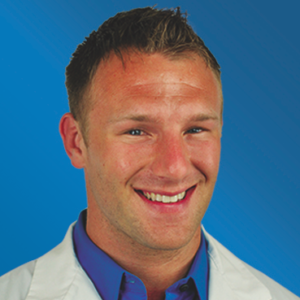 I'm a physician who focuses on lifestyle changes rather than medications for real healthcare. My goal is to make you leaner, more energetic, healthier, and most importantly – happier. Click here to learn more.